MOEEBIUS FINAL CONFERENCE - World Sustainable Energy Days, 28th of February 2019, Wels / Austria. CONFIRMED! MOEEBIUS introduces a Holistic Energy Performance Optimization Framework that enhances current modelling approaches and delivers innovative simulation tools which deeply grasp and describe real-life building operation complexities in accurate simulation predictions that significantly reduce the “performance gap” and enhance multi-fold, continuous optimization of building energy performance as a means to further mitigate and reduce the identified “performance gap” in real-time or through retrofitting. After nearly of four years of collaboration the MOEEBIUS project will soon finalise its activities. 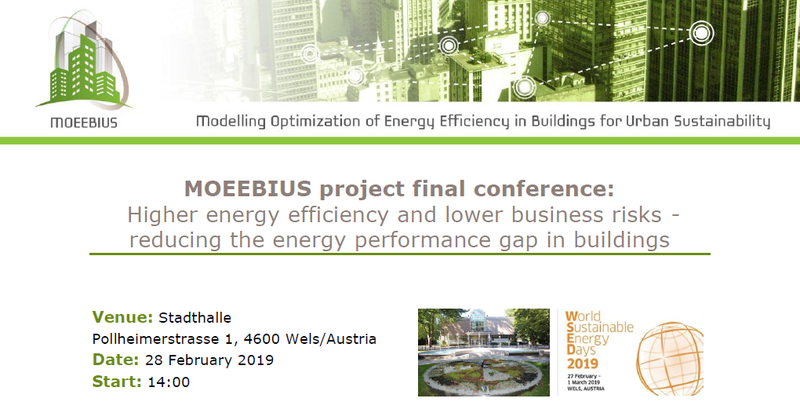 The MOEEBIUS culmination will be the project's final conference organized on 28th of February 2019 in Wels, Austria, as a part of World Sustainable Energy Days 2019. Our event will be held in the framework of European Energy Efficiency Conference - one of specific WSED events, focused on Europe’s commitment to a clean energy transition.This requires strong policies, competitive businesses, technology innovation and investments. WSED is one of the largest conferences on sustainable energy. The annual conferences features policies, technologies, innovation and market development through a unique combination of conferences and interacive events. It brings together more than 650 delegates from over 50 countries from business, research community and the public sector. We are very happy to announce the news - and we sincerely invite all to participate in the event and save the date: 28/02/2019. HOW TO REGISTER FOR THE MOEEBIUS FINAL CONFERENCE? During your registration process don't forget to fulfil comment field with your remark: "Moeebius workshop". We are happy to see you in Wels! This project has received funding from the European Union’s Horizon 2020 research and innovation programme under grant agreement No 680517.